Little library goers took their own “paws for reading” on Tuesday, Aug. 2 when Judy Burr and Linda Berk brought their two pups, Wilson and Xorra, to the Mt. Laurel Library. Here, newborns to children age 5 gathered to listen to short stories involving the day’s fitting theme, dogs. 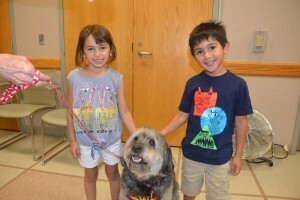 Once a year during the summer, both dogs meet at the library for this hour of dog-related stories, however Wilson and Xorra are familiar faces around the library due to their separate involvement in the library’s “Paws for Reading” program. This free library program, designed for grades first through fourth, helps children improve their reading skills by providing to them a nonjudgmental, furry audience twice a month. 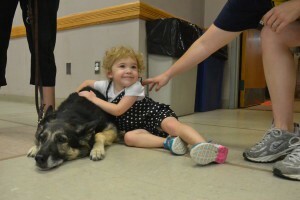 Through her involvement in these private support sessions, Burr has seen numerous accounts of her dog’s presence advancing the literacy skills of participating children. When giving examples from her volunteer work, Burr describes seeing significant increases in interaction in two boys with autism who read to Wilson, as well as in a young girl who had undergone serious surgeries and who experienced a disruptive home life but now shines with self-confidence. Burr described other scenarios where Wilson, who is a bearded collie wheaten terrier, helped children not only become stronger readers but also helped them to overcome their fear of dogs. Due to the Mt. Laurel library offering a safe, controlled environment, kids are able to become exposed to these animals and gradually work their way up to physically engaging with them. The work of Burr, Berk and their two dogs is especially important because it has been reported that subjecting children to the unbiased, four-legged audience will help them gain confidence in their ability to read. This way, children do not feel as embarrassed if they make a mistake while reading. Confirming these beliefs, one research study conducted by the University of California Davis found that after a 10-week interval, children who read to animals had their reading skills improve by roughly 30 percent. 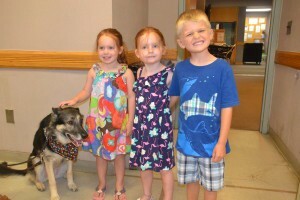 Burr and Wilson have been participating in the Paws for Reading program and coming to the library for five years, whereas Berk and Xorra are going on their seventh year of participation. Burr first adopted Wilson, named after her great grandmother Mary Wilson, from a kill shelter in Arkansas. Upon taking him to her vet for the first time, the doctor told her that Wilson was an ideal candidate to be trained as a therapy dog. Ever since, Wilson has been helping others just as they help him practice the commands Burr has taught him. Berk first got Xorra at 7 weeks old and trained her to become a Seeing Eye dog. 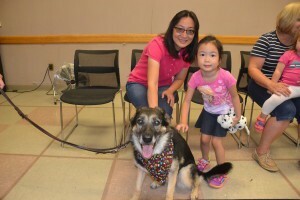 After not making the Seeing Eye dog program due to seasonal allergies, Xorra retired and became a therapy dog. Named after the Seeing Eye dog “X liter,” which she was born into, the full bred German shepherd has also helped her community by becoming a blood donor. Together, Burr, Berk, Wilson and Xorra hope to make a difference in the lives of as many Mt. Laurel children as possible.